At this weeks’ PLAN East Boston kickoff, someone said “but they approve everything” about the Boston Zoning Board of Appeals. I wondered how true this was. Zoning decisions are made available as PDFS and aggregated metrics are not offered, so I decided to generate and make available a plain HTML archive with aggregated metrics. 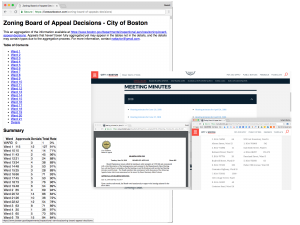 East Boston has had 127 appeals since the start of 2017 (30% more appeals than the next highest neighborhood) and 91% of them are approved! It is generated with a multistep process that involves some messy PHP scripts I wrote. 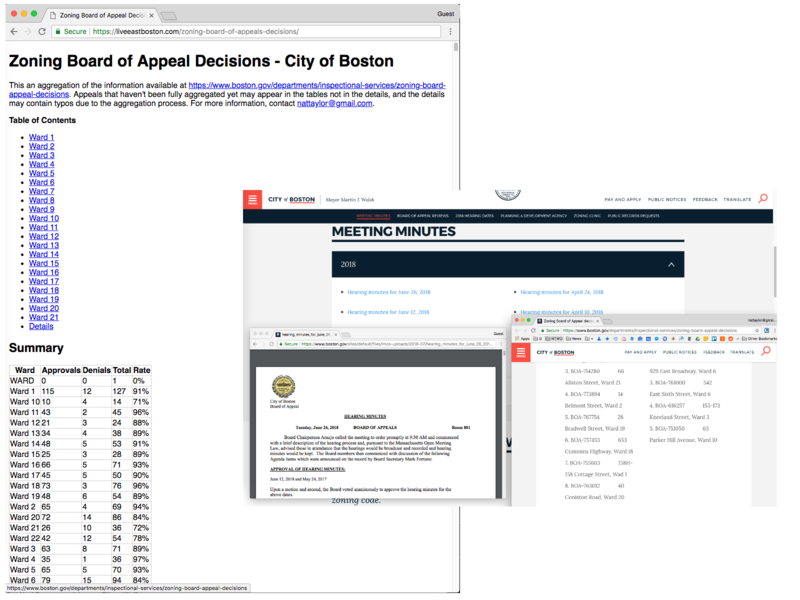 Next, I parsed the PDF meeting minutes from https://www.boston.gov/departments/inspectional-services/zoning-board-appeal#meeting-minutes. A few were raster image PDF, so I OCRed them with VietOCR to prepare them. For the text PDFs, I converted them to HTML with pdftohtml and a command like pdftohtml -noframes mypdf.pdf. Once I had processable text, I messily tokenized it on keywords like “Vote:” and then sussed it into a structured format with process.php. There is a single file mode which produces tabular output to be merged with the results from process-site.php and there’s multi-file mode which processes HTML results for use in the final step. The final step produces the HTML Archive with out.php. Each case is deep-linkable. When new meeting minutes are published, it will be just a few clicks to update the archive!